This month marks the two-year anniversary of my husband and I becoming full-fledged beekeepers. I love telling people that I keep bees - some react with fascination, others think I'm nuts. There's this notion that beekeeping is complicated, scary, and even dangerous. Really, beekeeping is none of those things. In fact, I'm convinced that just about anyone who cares enough about bees can become a beekeeper. 2. Having beehives helps your garden grow....and your neighbor's garden, too. 3. Beekeeping is a great way to be self-sufficient. Keeping bees is a wonderful way to be self-sufficient because honey is a great replacement for processed sugar. There are some start-up costs that come with beekeeping, but it's a worthwhile investment. If I remember correctly, we spent about $350 when got started -- that price included our two hives (with three deep boxes each), two beekeeping jackets and hats/veils, gloves, a hive tool, a smoker, and, of course, the bees (that price doesn't include the class I took, but that didn't cost much, either). After a few honey harvests, the hives will pay for themselves. The only real expenses after the initial start-up costs are for mite treatments (all-natural) and any supplemental feeding that may be necessary. Another self-sufficiency facet: in terms of food storage, you can't beat the shelf life of honey, because it lasts forever. Archaeologists have found honey from the ancient Egyptians that can still be eaten today. 4. It takes very little effort and time to keep bees. Do you have a dog or cat? You spend more time taking care of that pet than you would a couple of beehives. Even in the peak summer months when my husband and I do regular inspections, we probably spend less than an hour a month taking care of them. Seriously. The less you bother the bees, the better. All they really need is a short-and-sweet inspection every 10 days or so. The only time-consuming part of beekeeping is the honey extraction, but that part also happens to be a lot of fun. 5. Honey is good for your health. One caveat: to get many of the health and medicinal benefits, you need to use raw, unprocessed (and local, particularly in terms of helping with allergies) honey. Most of the honey at the grocery store won't cut it. That's where beekeeping comes in: you can't get honey that is more local and raw than the honey that comes from your backyard. Bees are completely fascinating. There are so many interesting aspects to bees and honey - I could go on and on about all the cool things I've learned about them. What I love is how much my boys have learned about bees in the process, too. My seven-year-old can tell you how you can differentiate the female workers from the male drones (one way: boy bees don't have stingers), how they function in the colony, and how honey is made (that same seven-year-old thinks it's hilarious to tell people that honey is "bee throw-up".). One time we even had a homeschooling family do a little field trip to our hives, where we let the nine-year-old suit up and help with an inspection. My kids and their cousins (since the beehives are at my parents' house, they are familiar with the hives) aren't afraid of bees anymore; they know how to keep a careful distance and how to move around them. They've even grown to enjoy getting close enough to watch the little bees at work on the flowers and vegetables in the yard! 7. Keeping bees gives you more control over your food and what is in it. Did you know that most of the honey found in grocery stores isn't actually honey? The honey found in stores is frequently "ultra-filtered", meaning that the pollen is completely removed. Without the pollen, the honey can't be tested to see if it came from a safe and legitimate source. Removing the pollen removes the evidence, in a manner of speaking, so that unsafe and unhealthy practices are hard to trace back to the beekeepers. Often, honey from foreign countries (particularly China) not only have traces of illegal antibiotics in it, but also are diluted high fructose corn syrup and/or other illegal sweeteners. Yuck. (For more information on this subject, along with a list of brands of pollen-free honey, you can read here.) 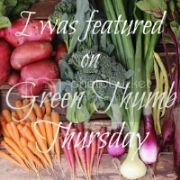 That's one of the main reasons I keep bees, garden, raise chickens, and cook from scratch -- I like knowing where my food comes from and what is in it. 8. The bees need our help! In the winter of 2012-2013, the US lost approximately 33% of its bee colonies, which is double the acceptable natural amount. Colony Collapse Disorder is big concern -- and, frankly, still a bit of a mystery. There are a lot of factors that could play into the problem: neonicotinoids (a particular pesticide known to kill bees), stress from being transported to various locations, bees being fed corn syrup so they'll produce more honey, among many other reasons. It's a systemic problem that will need the help of responsible beekeepers to right many of the wrongs that have been happening since Colony Collapse Disorder began showing up in the 1980s. There are lots of ways to help the bees and it can be done one hive at a time. 9. We need the bees! Maybe you've read the quote that many ascribe to Albert Einstein (though it's uncertain if he really said it): "If the bee disappears from the surface of the earth, man would have no more than four years to live." If we don't have bees to pollinate, we lose a big chunk of our food supply. For instance, 90% of apples, cherries, and oranges are pollinated by bees; 100% of almonds are pollinated by bees. Even beef and dairy would be affected since much of the alfalfa cows eat is pollinated by bees. Last year, a Whole Foods store in Rhode Island showed exactly what the produce section of the grocery store would look like without bees -- it's depressing, to say the least. Even one hive can help our bee populations by creating a healthy ecosystem for them, one in which they can thrive. 10. The world needs more responsible beekeepers. We live in a world where many people value quantity over quality, that the ends justify the means. This past fall, many beekeepers in my state had the disappointment of harvesting red honey. This happened because one beekeeper with a large commercial operation was feeding his bees a cheap candy-cane byproduct. Bees from around the area found the source, took it back to their hives, and the result was honey turned red by the artificial colors. Not only did it make the honey taste terrible, but it also made the honey possibly contain higher levels of lead because of the food coloring. Even worse, the red dye has affected the bees' genetics and brood production (brood refers to the various stages of development of baby bees). That's just one example; there are many more instances throughout the world today of bad and irresponsible beekeeping practices. The world needs more beekeepers who respect the honeybee and treat them well. Sure, I've been stung a few times. That first year when we didn't get a honey harvest was a huge bummer. Sometimes it takes every ounce of control I have to not freak out when the bees get agitated and start diving toward my face. But, overall, I love being a beekeeper. I love watching the bees at work in my parents' garden. 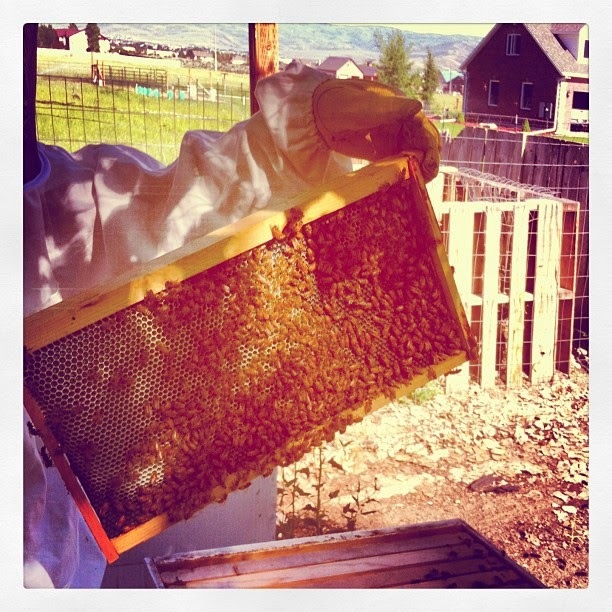 I love lifting the lid off the hive and seeing them busy in each of their jobs. I marvel at the thousands of perfect little hexagons in the honeycomb. 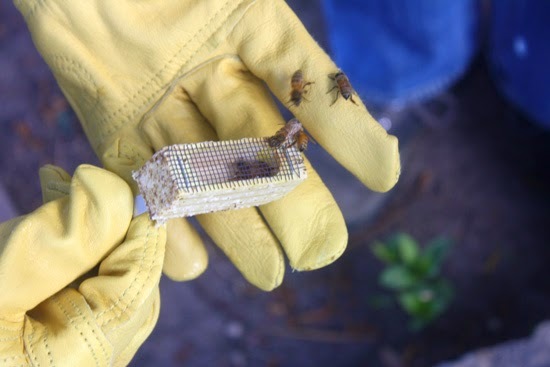 I get a surge of excitement during inspections when I can spot the tiny eggs in the honeycomb -- I've even witnessed a few bee-births, when they come out of their little enclosures for the first time. I love scraping off chunks of comb that are dripping with honey and then sharing it with everyone at the house. And extracting the honey is exhilarating, that mixture of excitement, awe, and gratitude. Who would have thought that I could grow to love an insect as much as I love those honeybees! They truly are a wonder in this world of ours. Fabulous post. I have GOT to do this someday. And I can already sense Green Bean swooning. What do you do with them in the winter? @Tom -- When we do our honey harvest, we have to make sure to leave enough frames of honey for the bees to eat through the winter (hence the reason we didn't get any honey our first year - there wasn't much extra once we'd given the bees the honey they needed). After that, we give them a quick mite treatment, reduce their hives to just two deep boxes each, and then we try not to open the hives until spring. The bees hunker down in there in a big cluster and keep the hive surprisingly warm. Since our hives are kept where it gets quite cold in the winter (zone 5b, where the lows can get down to -15), we wrap the outside of the hives (though careful not to block the entrance, because the bees do go in and out on warmer days) in black roofing paper to better absorb the heat from the sun. Our bees have overwintered well ever since we've had them. They are tough little creatures! The worker bees you see in the fall in a hive do not make it until the spring. In spring, the workers are all new. Good idea to wrap the hive. It keeps them from working too hard to keep the cluster warm. Enjoy. Swoon!!! (You guessed it Betsy). I have wanted to keep bees forever but have been intimidated by the learning curve. Here is another nudge to do it. Bee keeping is definitely on my bucket list should we get a larger property. We are on a medium sized suburban lot. But a friend who lives nearby, who backs onto a farm, has an arrangement with the farmer to keep a couple of hives on the edge of his property. He is a second generation bee keeper and his son dresses as a bee keeper every Halloween!